Name: American Plains Bison, more commonly called buffalo. Range: Portions of Texas, Oklahoma, Kansas, Nebraska, Colorado, New Mexico, Wyoming, Montana, North and South Dakota, Idaho, and Canada's three western provinces. Note: There are no bison living free, all are in some type of captivity for protective reasons. Diet in the wild: Grass, small plant growth, small shrubs. Bison are hoofed mammals that have a large heavy head with short black horns and high humped shoulders that are covered in long black fur. The remainder of their body is covered with shorter brown fur. However, there are extremely rare occasions when a white buffalo will be born and keep that fur color for the remainder of its life. Normally, a single calf is born in May or June and are yellowish-red in color. Bulls, or males, will commonly stand six feet tall at their shoulders, they are ten to twelve and a half feet in length and exceed over one ton in weight. Cows are much smaller. There were a vast number of bison living in North America at the time of European discovery, there were an estimated 60 million living in the late 18th Century. With the advance westward of colonists, numbers dwindled and by 1820, there were none left east of the Mississippi River. The age of expansion westward brought the transcontinental railroad and the United States governments desire to hunt and eliminate the animal as a way of killing off the Native American population that stood in their way. All this resulted in there only being six hundred bison living in the United States by 1889. However, with the help of legislation for their protection, there are over 200,000 living today on private ranches, parks and reserves. The largest single herd is 3,600 that roam freely in Yellowstone National Park, but that number is threatened because of severe actions taken by the state government of Montana and a severe winter. Bison are in the bovid family and are not true buffaloes. They have fourteen pairs of ribs as opposed to the thirteen that are found in true buffalo. 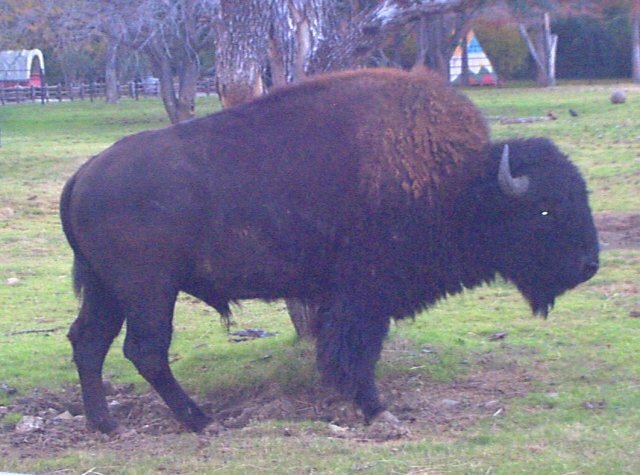 A young bison can mate as early as three years of age but will not become full grown for another five years. In some cases a bison may live to be thirty to forty years old. It has been discovered that any attempt to train a bison has failed because they have quick tempers and are such a massive size. Bison will congregate in small family groups that will form a large herd with other family groups. A close relative is the Wood Bison that has dwindled in numbers. It is larger with a longer neck and hair on its forehead, hairy horns, a darker coloring and a square hump. Plains bison also differ from Wood Bison in that they have "chops" or large clumps of hair on the back of their front legs. Comments about the bison of the Fort Worth Zoo. 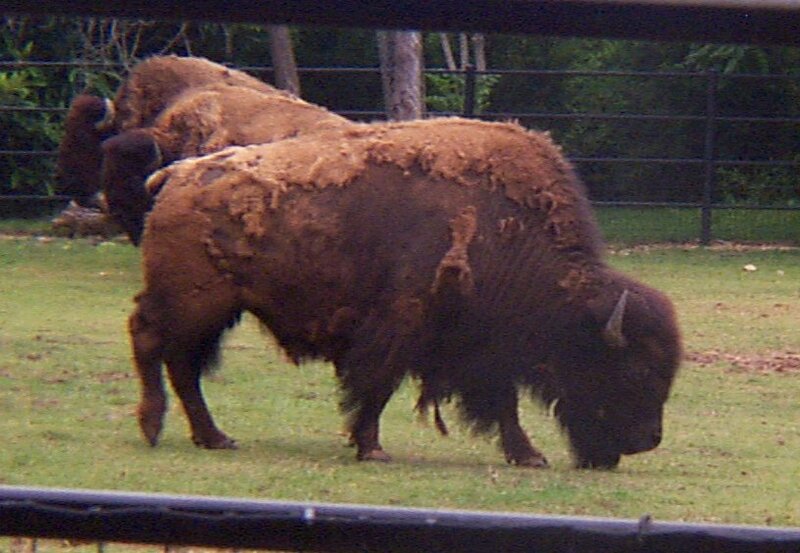 The bison at the Fort Worth Zoo act remarkably similar to cattle. This is probably due to the slight domestication of the once wild animal to help it survive man's attempts to destroy it. Despite it being spring, most of the animals in captivity have not lost their winter coats. They appear yellowish brown in color as compared to the darker brown of the coats of those who have made the adaptation to the warmer climate. The bison in captivity seem much more gentle than you would expect to see from a two ton, mostly undomesticated animal. The American Bison can be used to symbolize the American West. In the 19th Century, the american government tried to destroy it as a way to element the Native Americans and to make way for expansion. The Bison is a majestic creature that epitomizes the simplicity of nature and all of its beauty, but that beauty was almost destroyed because of man's greed for land and careless disregard for the environment. It is only because Bison were at the brink of extinction and someone decided to do something about it that we are able to observe this amazing animal today. Burton, John A. The Atlas of Endangered Species 2nd Ed. pp. 70 & 91. MacMillan Library Reference USA. New York, 1999. The World Book Encyclopedia. vol. 2 pp. 684-685. World Book, Inc. Chicago, 1991.
http://www.nbabison.org/ National Bison Association, 1997. March 9, 1999. 1:35 PM.